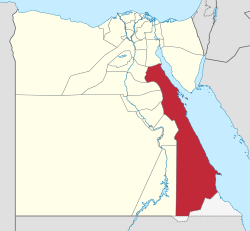 Location of Red Sea Governorate in Egypt. On 8 January 2016, two militants, armed with a melee weapon and a signal flare, arrived by sea and stormed the Bella Vista Hotel in the Red Sea city of Hurghada, stabbing three foreign tourists from Austria and Sweden. One of the attackers was killed by the security personal, the other one was injured. The Islamic State of Iraq and the Levant claimed responsibility. ↑ "ISIS Egypt Hotel Attack: Deadly Hurghada Resort Siege On Foreign Tourists Claimed By Islamic State Group". ibtimes.com. 8 January 2016. Retrieved 8 January 2016.